Around the country, in flight schools, clubs, pubs, etc. pilots can be heard discussing the 'best way' to operate a General Aviation (horizontally opposed) aircraft engine and there will most likely be as many opinions as there are pilots. From personal experience, some are quite intimidated by the little red knob/lever that controls the mixture. After start: Can I lean the mixture to prevent plug fouling? Most schools will say no, as you might inadvertently try to take off with a mixture that is too lean; others might encourage it but remind you to set a richer mixture/full rich for take off. My advice is; lean aggressively so that it is impossible to get enough power to try to take off and do your vital actions/checklist thoroughly. An enquiring mind should ask, 'why should it be necessary to lean the mixture after start?' The answer is simple; an aircraft engine does not have a choke to ensure a rich mixture for your cold engine that your car engine does have. An aircraft engine does have a primer to assist the start, but then needs a rich idle mixture to help a cold engine to run. Once the engine is warm, the idle mixture is too rich and combined with the low engine speed at idle, leads to cool combustion temperatures and plug fouling. The take off: The flight school instructor will teach you (at sea level) to take off with all the levers in the forward position. Full throttle, RPM set to maximum and mixture full rich. At 500 foot altitude, you might be taught: Power - Set to 'Top of green.' Pitch - set to 'Top of green.' Mixture - Set to 'Top of green.' Having done many hours in a PA28-180, I might question why I cannot leave the throttle wide open and just reduce the RPM to 'top of green.' No! You cannot operate the engine 'over-square.' Somehow people still believe that operating an engine 'over-square' (Manifold Air Pressure in inches - greater than RPM in hundreds) can lead to detonation/engine damage! Now if I were to take this same instructor for a flip in my Cherokee 180, he would be quite happy to sit there as I add full power for take off and the Lycoming manages to get 2250 RPM with the fixed pitch 'cruise' propeller. This is A - OK because the PA28 does not have a manifold air pressure gauge, so the instructor cannot see that I have 29 inches MAP and 2250 RPM. The fact of the matter is, most GA engines (Lycoming and Continental) have pistons with a compression ratio of 8.5:1 and it is very difficult to induce detonation in any engine without a supercharger. “… in general, detonation is a very rare event and is usually caused by fuel or ignition problems." In local Internet Chat Forums, the Rich of Peak (ROP) versus Lean of Peak (LOP) argument rages on almost a daily basis, yet most people do not know that most of the answers can be found in their Pilot Operating Handbook (POH) or in the Engine Manual. Please understand that if you fly a GA aircraft with a carbureteted engine from one of the two engine manufacturers listed above: then you cannot run LOP due to the really bad fuel distribution in these engines. On these engines, in the cruise, once temperatures have stabilized and provided you have set less than 75% power you can lean as aggressively as you like provided the engine runs smooth. Lean till the engine runs rough, then richen up just enough to ensure smooth running. An engine that has been leaned to the point of running rough, is not detonating it is only running rough due to the bad fuel distribution and as a result one cylinder is making more power than another and this leads to torsional vibration in the crankshaft, and that is bad. How do I know I have less than 75% power? Carbureted engines have another anomaly: they are fitted with an 'economizer.' Basically a simple device, the metered fuel entering the venturi, first passes through an emulsifier. This introduces air into the fuel to assist atomization. The emulsifier is supplied by two air bleeds; but at full throttle one bleed is blocked off to ensure a rich mixture in the case of a go around or emergency. However, atomization is less complete and therefore fuel economy will suffer, so you have to throttle back a bit to ensure economy. Flying with throttle wide open only works in a fuel-injected engine. If you have a good engine monitor and balanced fuel injector nozzles such as those supplied by various manufacturers, then it is possible to run your engine LOP; but first let us have a look at the relationship between EGT, CHT. HP and BSFC. 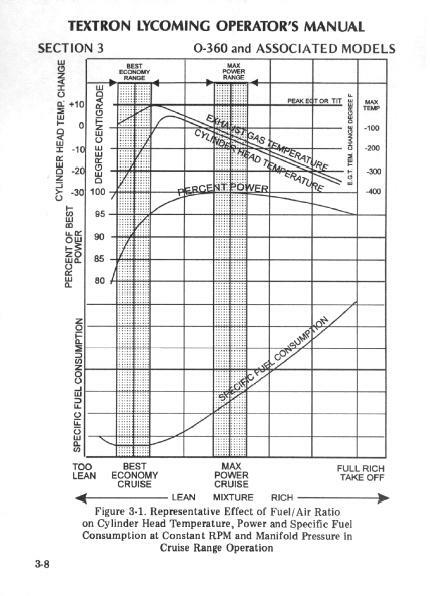 The following graph is copied from a Lycoming manual. 1. Notice that as the mixture is leaned out, the EGT and CHT rise together. 3. The CHT peaks at about 30F ROP, but EGT continues rising. 4. From max power, the power drops off slowly and from peak EGT power drops off more rapidly and CHT drops radically. 5. Whilst this is happening, BSFC has been gradually improving and from peak EGT to 50F LOP, the BSFC is close enough to level, then becomes worse again. So what can we make of all of this? Is it actually economical to operate LOP? Look at the power graph, HP drops fast from peak EGT to 50F LOP, but BSFC does not improve. At the same time CHT drops radically, so the engine should be happier, last longer. If you run your aircraft on Mogas, then you had better research the meaning of "Research Octane Number" (RON), "Motor Octane Number" (MON) because Avgas and Mogas are rated on different scales. So comparing 100 Octane Avgas to 95 Octane Mogas, is kinda-like comparing Knots to MPH. The LOP/ROP debate has been going on for years and will continue for years more, I am sure. Deakin refers to the WOTLOPSOP community ("Wide Open Throttle, Lean of Peak, Standard Operating Procedure") and I agree with him. Large supercharged radial engines such as P&W R2000 (DC4) or the R1830 (DC3) have carburetors that supply fuel to the center of the impeller of the supercharger and due to the cylinders being mounted radially, each cylinder is fed the same amount of fuel and air. As a result the mixture lever has three positions. Idle cut-off, auto-lean and auto-rich. Auto-rich is used for take off and once settled in the cruise, auto-lean is selected. But, what is auto-lean? You guessed it: due to even fuel distribution, these engines run smooth at 50 LOP. So LOP has been around since the 30's. Highly recommended reading is Pelican's Perch #8 “Go Ahead Abuse Your Engine” #18 “Mixture Magic” and #63 & 64 “Where Should I Run My Engine.” If you operate a Piper Chieftain, then #63 & 64 might just make you rewrite SOP's for that aircraft.